Providing dictatationsync, e-accounting, pocketchm services. EAccounting is a invoice document management system with inbuilt scanner and file uploading system. 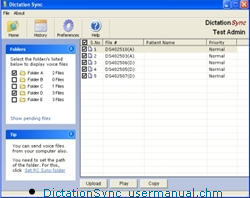 DictationSync application is designed for sending voice files from your Olympus voice recorder and digital voice files from your computer to your transcription service. EAccounting is a client software developed for specific purpose of scanning and managing the invoice documents. Users can start using the software by entering the username/password which is authenticated by the server side component. The server authenticates the user and sends the user specific data and preferences. EAccounting can connect to any type of scanner and scan documents and upload it with specific naming convention. The scanned ocuments are scanned in PDF format with file name stamp on each file. Different options are available for scanning like scan option screen display and user of auto feeder, etc. Most of the user manual and many of the e-book are distributed in .CHM format due to its ease of handling and portability. Pocket PC (2002, 2003, WM5) does not support the CHM format. 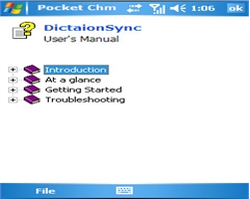 ASDRC PocketCHM reader give you the ability to read any CHM on your WinCE based devices.The picture above shows the ASDRC PocketCHM reader displaying the usermanual of our product DictationSync. Its very simple to install and use. windows Mobile 1.0 gives a deep insight into the personalities of others by analysing their signatures. 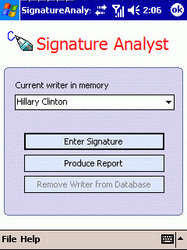 Signature Analyst for Windows Mobile 1.0! With this program, you will gain deep insight into the personalities of others - whether you'v met them or not. The world is filled with fascinating strangers, celebrities, historical figures, potential business associates or employees, and many others. Signature Analyst for Windows Mobile 1.0 gives you access to these people as well as to your family, friends and acquaintances. All you need is a person's signature, and accurate personality assessment reports can be produced. Signature Analyst for Windows Mobile 1.0 makes it possible for you to do the analysis yourself, without formal training in graphology.